Hi there, thanks for your question. Yes, you can download Mighty Grocery on your Kindle Fire from Amazon AppStore. 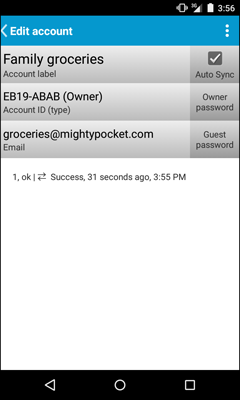 The app allows you to manage lists offline and changes will be synced when you online if you set up the MG account. Please see Sync with cloud User’s Guide for more details. I’m looking for a shopping list app to share with my wife. Mighty Grocery seems like it will be perfect. Once we upgrade to the full version, is there a way to access our lists by PC online? With the initial creation of the list, it would be much easier (and faster) to use our PC and a keyboard. Hi Joe, thanks so much for your feedback. Yes, it is possible to access shared shopping lists using the My Mighty Grocery website from your PC. Please see Sync with cloud User’s Guide for more details. Thanks and please let me know if you have any further questions or comments. We have discovered the interesting app and we need to confirm functionality. my wife and I are planning to use the same shopping list, so anyone who identify any need is adding to the shopping list. the person occasionally stops at the store uses the updated list for shopping. 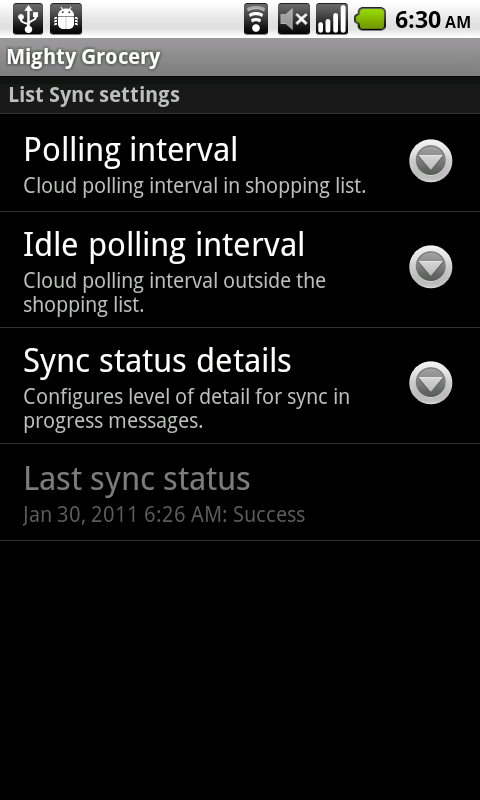 the idea is to use the sync option for the common shopping list. Hi Dede, thanks for your question. Yes, you both can use Owner access to accounts. However, please note that guests can modify shopping lists but they cannot add or delete shopping lists on cloud. I backup my Grocery list and then found the list was displayed under one generic aisle called Groceries. i don’t think i changed anything else. i checked a few of the items and they still have the correct aisle in their details. All my other lists are still displayed by their aisle as expected – what’s gone wrong with this one? Hi Martin, thanks for your comment. Most likely you have enabled the “Master list” setting for your shopping list. Please note that items are grouped by sub-lists in a master list, not by aisles. That’s all very well but fact remains I only did a backup and all changed. I now have noticed that the 4 items added before backup no longer exist! I have also searched for this master list and sublist and cannot find a setting. my list used to be groped and displayed by aisle. My settings still say that. I cannot see/understand how to rectify the situation. I have been through everything ay least twice and am no wiser. Martin, sorry for missing this last time, here’s the link to the Master list setting. I would appreciate a few more details so we could have a closer look at the problem. To keep your privacy, could you please contact me at hi@mightypocket.com and let me know your Account ID and which items have been missing in the last backup? Also, please let me know which shopping list has items grouped by generic “Groceries” aisle. Hi am not sure how or where to save my files. I went away for two months and when I came back again my app was devoid of info, I thought it was because I had changed sd cards, but putting the original back in did not work. I have downloaded the backup from the web but it doesn’t show the history. ( perhaps I haven’t backed up recently enough) but at least my phone should have the info. Please tell me how I can save/ backup locally as I live in Kenya and I don’t always have the internet enabled. Another request: I live in 2 places Kenya 10 months, Uk 2 months. I didn’t bother using this app over Christmas cos I couldn’t figure out how to set up a second currency without messing up my history in kenya shillings. Hi Derrick, thanks for your question. Unfortunately, it is not possible to backup your Mighty Grocery data locally. Only backup on cloud is available at the moment. We may consider adding local backups in the future. As for currencies, the app only changes the way it displays prices for you. Actual currency conversions do not happen. I have tried twice to move my info from my Android tablet to my Android phone. After 1st time, I uninstalled app from my phone to try again. Same issue. All of the customizations that I’ve made in my tablet aren’t coming over to my phone. My phone just shows your “programmed” items and isn’t updating any lists. My tablet periodically shows the tiny syncing window. My phone says the pull is complete…but no info is changing. Hi Vickie, thanks for your question. 1. Delete all duplicated lists from cloud: Menu –> Settings –> Accounts –> (your account) –> Cloud actions –> Delete lists –> (select lists to delete) –> Delete lists. 2. Push lists from your primary phone: under your account –> Cloud actions –> Push lists –> (select lists) –> Push lists. 3. Pull lists on your secondary phone: under your account –> Cloud actions –> Pull lists –> (select lists) –> Pull lists. 4. 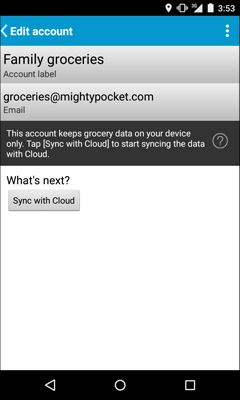 To make sure that you don’t have duplicated lists on cloud, go to My Mighty Grocery (http://my.mightygrocery.com) website and use your email and password to login to your account online. P.S. I assume that both your handsets logged in to the same Mighty Grocery account. You may want to double-check this by comparing Account IDs for records under Menu –> Settings –> Accounts. I anticipate using Mighty Grocery around once a month, and sometimes that will be a little more than 30 days. I understand a need to moderate available resources, but purging every 3, 6 or 12 MONTHS would seem to me a much more appropriate timeframe to support backup and sync operation from a paid app. Alan, thanks for your feedback. Kindly note that we haven’t applied this policy yet, so no backups have been removed. Anyhow, I agree that 30 days may be a little bit extreme, so we will be changing the policy to 180 days soon. So now that I’m successfully syncing between my Spouse’s device and mine, she asked me if she should check her Grocery list every day before she leaves work to see if she needs to grab anything on the way home, or if I’m going to email her to let her know if I’ve added anything to any of the lists. That made me think it would be great if there was an option to auto notify a synced device if anything had been added to a list at either end. My apologies if this is just a repeat of something that has been posted before. Tom, thank you for your feedback and suggestion. We may consider notification feature going forward. I love the app and used it and read how to set up an acct and what is the cloud, I’m not sure what cloud you are using for me to access. 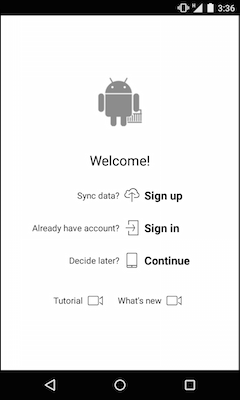 I have Google and Sugarsync. 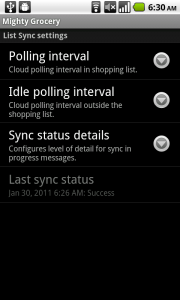 I can see the app syncing but to where it is syncing to. My phone (HTC EVO) has crash several times and I lost my list and had to start over. Hi there, thanks so much for your feedback and your question. Kindly note that by cloud we mean our server infrastructure designed to keep your data safely online. It’s recommended to create backups regularly to keep your data in a safe place so that you could restore your grocery data in case of emergency. Thank you for your immediate response, so where is this cloud located online so I can assess it when my phone has ben rebooted and I have to reinstall the app, it as happen 3 ties and I had to start over and lost my grocery list. Thank you in advance. Thanks for your response. Please keep creating backups often and your grocery should never get lost again. Feel free to contact us again with any questions or comments. Definitely my favorite shopping list app and it keeps just getting better. Thanks! Any plans to bring history view to the web UI? Hi Phil, thanks so much for your feedback and your question. Yes, we plan adding history to the Web UI. Hopefully, it will be available soon.